Omg! That is so absolutely amazing! He really likes it! 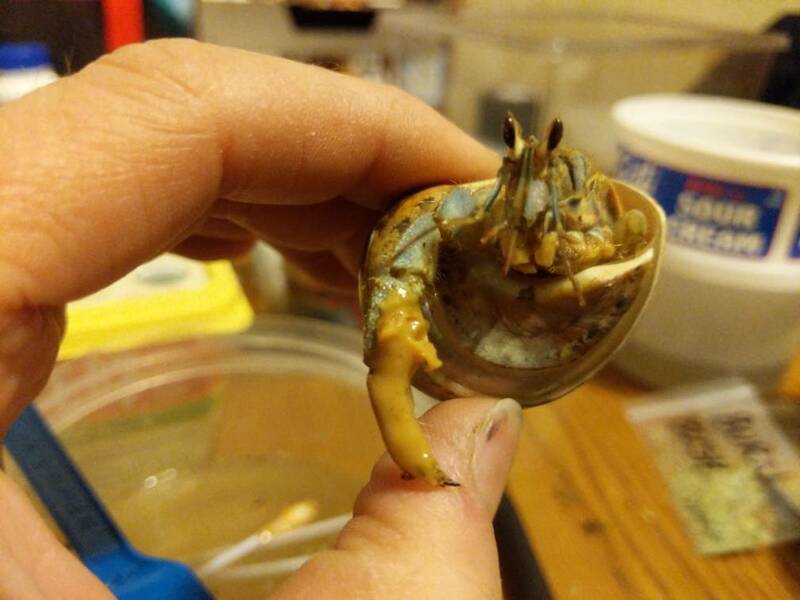 I love when your feeding him, you just hold him still and he moves in and out of his shell to get to his food! You are doing an amazing job! Praying for Eddie to make a full recovery! He is such a sweetheart! God forbid I ever find myself in an emergency situation that requires an iso, i have NOTHING i could use. Tupperware, mixing bowls, cake pans, takeout containers - trust me, in an emergency anything works as an iso! And in cases like this when they aren't mobile they don't need much to keep them secure. Like wodesorel said any small containers will work even putting in your regular tank will save having another tank to deal with. Last night I caught Eddie climbing up the small water container I had him in. It's only 1.5 inches tall but he was peeking out at me. I don't think he would have been able to pull himself out but he did manage to climb up. This morning I gave Eddie his baths. He ate some bee pollen, crab exo, and some of the Calci worm/ daphina/ chia mix. So far he seems to be doing very well. Glad he is doing better! Eddie ate very well again tonight! He chowed down on a fish bone mix, plant mix, nut medley, gammarus shrimp, crab exo, pork liver, and water flies. He barely touched the bee pollen and burning bush. At the end of his feeding we gave him some coconut oil on a Q-tip. First he tasted it with his mandibles then just planted his mouth on the Q-tip! Then he did the same with peanut butter. He got that all over himself. 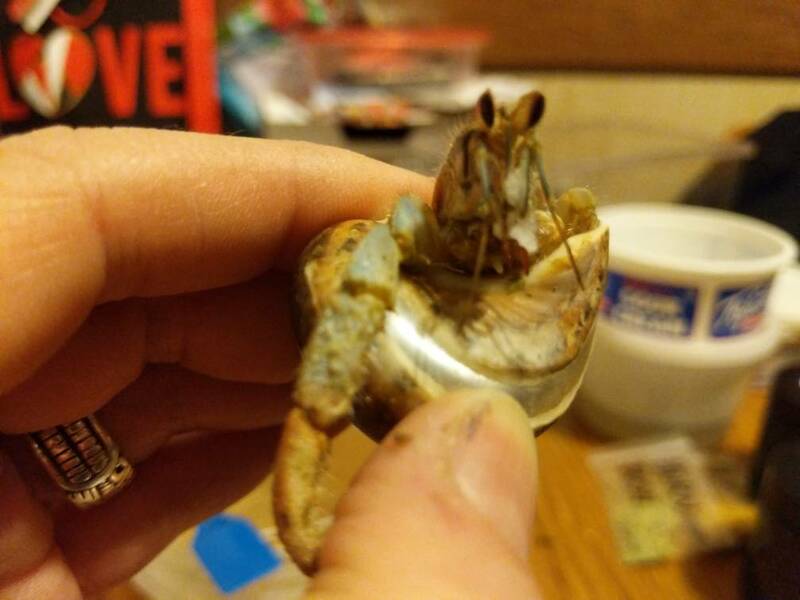 He was being a silly crab! It was nearly impossible to hold him and the Q-tip steady for him to continue eating. I believe we saw a molt sac on his left side near his abdomen. It's a dark grey color. It appears to be round. It could also have been one of his rear legs curled up too. 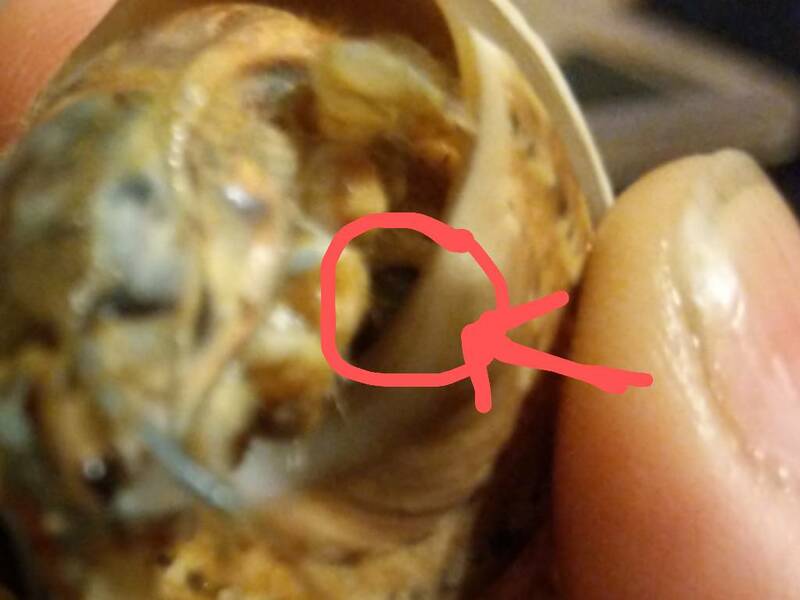 Possible molt sac? I'll try and get a better picture tomorrow. Thanks, I hope so too! I'm thinking I have at least another week possibly two of hand feedings until he is ready. Yesterday morning Eddie ate well again he ate chia seeds, wild salmon, calcium bites, baby food, coconut oil, brine shrimp eggs, Indonesian bat guano. He refused Irish moss. Last night he also ate well. I forget what all he ate last night. It was late last night and forgot to list everything because I was tired. Once again today Eddie had a great appetite. He ate Bee Pollen, crab exo, chicken, beef heart, matcha green tea biscuit, Dule flakes, greensand, baby food, brine shrimp eggs, and coconut oil. He barely picked at the Azomite and silkworm/ daphnia/chia mix. I have been giving him his fresh and salt water baths twice a day. 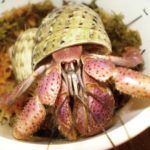 I am also giving him medicinal baths that another crab page recommends with myrrh root, marshamello rood, calendula Flowers, and chamomile. They believe it helps to speed up their recovery time. This morning Eddie wanted out of his medicinal bath. Even with one leg he can partially climb up on things. This morning Eddie ate a little of everything I gave to him. Tonight he barely ate for me. He picked at a little, maybe 2-3 mouthfuls of Azomite, greensand, beef liver, calci worm, aronia fruit powder, baby food, and purple sweet potato power. He ignored gree tea biscuits, pork liver, plant mix, shredded beef, beef heart, white fish, rabbit,egg shell, crab exo, bee pollen, mysis shrimp, nut medley, plant mix, honey, and coconut oil. This marks the 8th full day I have been feeding him. I'm going to have to review the footage to see if he was eating anything during the day. I’m so happy that he is eating well, that will give him strength to have a successful molt! Keep hanging in there Eddie! We’re rooting for you! Eddie isn't eating as much as he did for the last day or so. He is taking a bite or two then that's it. I'm wondering if he could be getting ready to molt in just over a week of finding him. I believe I will keep trying to feed him until Thursday or Friday. If he still isn't eating I will assume he is ready for another molt. He still does not have any gel limbs so that is telling me he isn't ready. I'm not sure how soon they begin to form. I do know that after they form it is only a few days away from a molt. I hope he does molt soon!